Visionace Max is recommended for those who wish to support the maintenance of their normal vision. It is ideal for contact lens wearers, or those working long hours at a computer screen. Only the purest pharmaceutical grade fish oil produced in Norway has been used in Visionace Max capsules. To ensure maximum benefit the oil is carefully concentrated to increase its DHA and EPA content and further purified. Each batch is rigorously tested, certified and fully compliant with stringent EC and WHO rules on environmental pollutants. Harvested in some of the world's cleanest waters, Krill oil is pollutant free with the naturally occurring Astaxanthin giving the oil a deep red colour. The presence of Astaxanthin also helps to keep the Krill oil stable without the need of additives, protecting the beneficial Omega-3 fatty acids from becoming rancid due to oxidisation. The Red Krill is 100% pure and unlike some Krill oils is not blended with ordinary fish oil. No. Visionace Max is a food supplement formulated with specific nutrients to help contribute to the maintenance of normal vision. It will have no direct benefit on conditions such as glaucoma and floaters. Specific nutrients in the formula such as vitamin C and E plus, copper, manganese, selenium and zinc contribute to the protection of cells from oxidative stress. Generally, Visionace Max may be used alongside medication, as it contains only moderate levels of vitamins and minerals and is free from drugs or hormones. For specific advice on taking Visionace Max with medicines, please contact your doctor or pharmacist. No, Visionace Max will not have any effect. Visionace Max contains 28 multivitamin tablets and 28 Omega-3 capsules. Take one tablet and one capsule per day. One multivitamin tablet and one Omega-3 capsule per day is recommended with or immediately after your main meal, with water or a cold drink. Taking the dose with a large meal maximises the absorption of the nutrients and can reduce nausea, which is sometimes experienced if multivitamins are taken on an empty stomach. Visionace Max should only be taken on a full stomach. Always ensure that Visionace Max is taken with plenty of cold liquid, not tea or coffee, as this may cause the tablet and capsule to disintegrate too early. Visionace Max has no known side-effects when taken as directed. Do not exceed the recommended tablet/capsule intake. In case of overdose, seek medical advice immediately. 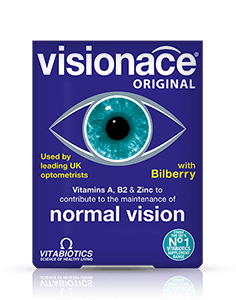 No Visionace Max is not suitable for vegetarians as it contains fish oil in a pharmaceutical grade gelatine (bovine or beef) capsule. Adults can obtain DHA and EPA indirectly through the conversion of the essential fatty acid alpha-linolenic acid (ALA), present in vegetable oils such as linseed but this process is very inefficient. Visionace Max contains fish oil as it provides a much more reliable, direct source of DHA and EPA. Results vary amongst individuals but in most cases, we would expect the beneficial effects of the vitamins and minerals in Visionace Max to build over several weeks, with noticeable results in one to three months. 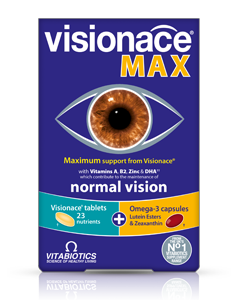 There is no maximum length of time over which Visionace Max may be used, however, a regular intake is recommended. Difficulty in swallowing tablets or capsules is quite a common experience. Vitabiotics have researched this extensively, trying different methods, and hope that our tips will help you swallow tablets or capsules with ease. The usual advice for those who have difficulty in swallowing tablets, is to break the tablets into 2-3 pieces, before swallowing with plenty of liquid. For capsules (which contain liquid), and in cases where people have more difficulty in swallowing tablets we recommend after chewing some food (e.g. banana), just before you swallow, pop the tablet or capsule into your mouth and swallow it together with the chewed food, followed by some liquid. The throat opens up wider automatically to swallow the chewed food and hence the tablet or capsule should go down with greater ease. Alternatively the tablet or capsule may be swallowed with thicker liquids such as yoghurts or smoothies. We hope these tips are of help.